A couple of years ago I came across the American Film Institute list of 100 years 100 movies (PDF), and off an on I have attempted to watch all of them. The list I used apparently has been updated, they now have added new movies including Toy Story. Back when I added the movies in Netflix not all of them were available but I believe there were about 80+ of them. I watched some when I was younger, so it was nice to be able to watch them again with a greater appreciation for what they have to offer. Last few movies I have watched are: The Miracle Worker, A Place in the Sun, Easy Rider, My Fair Lady and Sweet Smell of Success. If you ever get a chance you may want to watch a few, it is interesting to see how some things just never change, while others do. Here is a water tower sketch I did during my lunch hour a week ago. 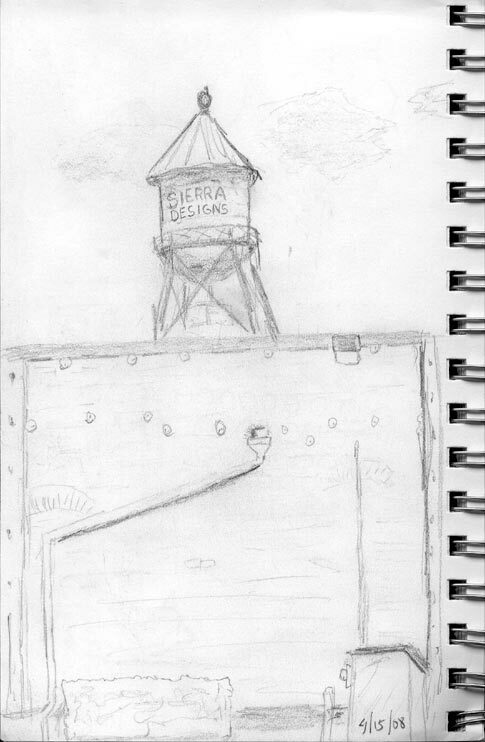 I have seen this water tower for the past couple of years on the way to work, figured it was time to sketch it. I saw the brick building and felt I should also add the bricks but then decided not to, I think there are times when we just want to do a quick sketch to capture the location and next thing we know it has become a drawing, with all the extra detail… and that is the challenge (at least in the beginning… what not to include). For this sketch I used the Tombow Mono 100 HB pencil and I liked it. Tools are tools right? It is practice, practice, practice what allow us to improve! Some say that it is not necessary to have better tools, other say that you might as well use them to get better results. I guess in the end it is a personal journey and perhaps one has to try both and see what works best. Personally I think that if you can, you should use the nicer tools. I am still using student grade watercolors simply because I refuse to let them go to waste, once I am done with those I’ll move on to the artist grade. It just occurred to me that maybe I should try the nicer grade as well so I can see the difference, and I think I will try that next. By the way I am looking for a nice pencil sharpener, if you have a favorite please share. April 11th, 2009 was held in Chinatown, San Francisco, CA. Unfortunately I was unable to attend 🙁 however I was able to do some sketching locally in downtown Santa Rosa. First of all, it was a quiet Saturday perhaps because of the Easter weekend. 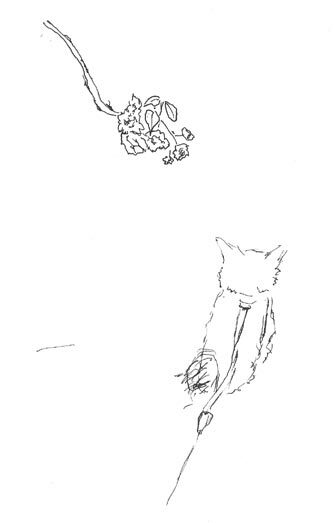 The first couple of sketches were done while I took our little dog for a walk, the cherry tree blossoms were dancing with the wind, and while standing there looking I noticed a branch that kept swinging up and down as the wind made its presence known, after a couple of sketches my dog grew impatient so we moved on. The rest of the sketches were done in downtown Santa Rosa. On the way to our destination, while crossing the street I sneezed, and to my surprise a passenger in a passing SUV said bless you which surprised me, because there have been situations where I am next to someone and then sneeze and they don’t say anything, or you say that to them and the same. That small token set the tone for the day! 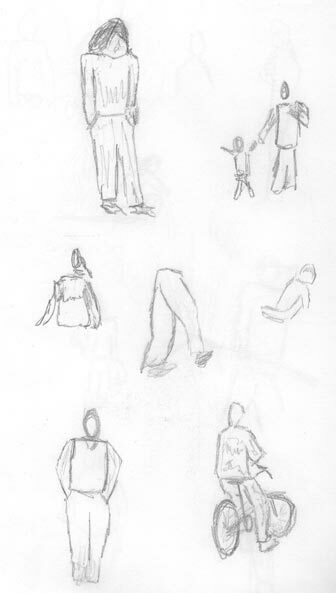 I decided to sit at the edge of the park and observe / sketch people as they were walking by. It was quite an interesting exercise, people walked pretty fast, most had unhappy faces with no smiles, not one single person stopped to look and most seemed deep in their thoughts. It was actually quite a challenge to sketch them because they were moving pretty fast (probably rushing to prepare for Easter) and while there were people sitting at a nearby restaurant patio, I decided to stick with the challenge of drawing moving targets. The following events caught my attention so I decided to make a note of them. 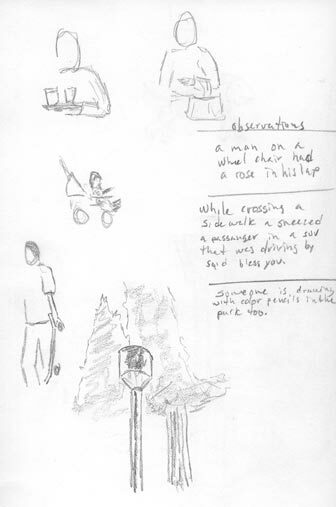 A couple went by (I didn’t sketch them), it was a woman with a man on a wheelchair who had a red rose on his lap, I thought that was interesting, perhaps it was for his mother, or perhaps it was for his wife, his sister maybe? where are they going? to eat at that restaurant? maybe they are meeting someone there? who knows!!! I found myself exploring the different potential options, which made this a lot more enjoyable than sketching buildings and landscapes which I typically do. 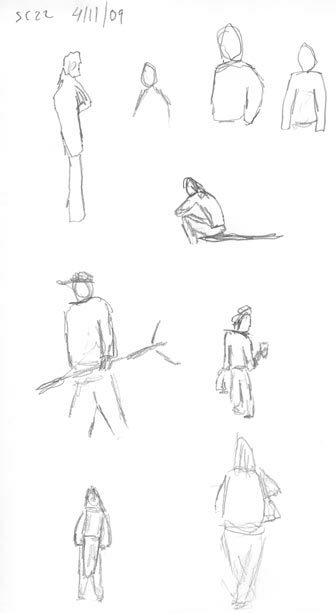 I also noticed a person drawing in the park, as I turned to see if there were other subjects behind me. He appeared to be using colored pencils, and yes I was curious to see what he may be doing.. 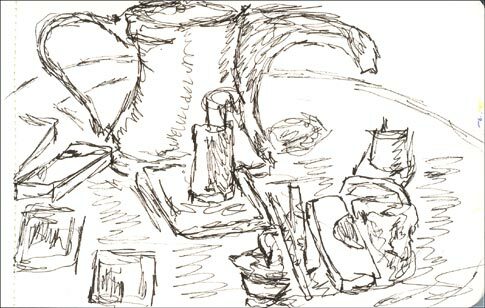 I guess it is human nature, but opted to concentrate instead on my own sketching. 22nd SketchCrawl San Francisco from Goro on Vimeo. 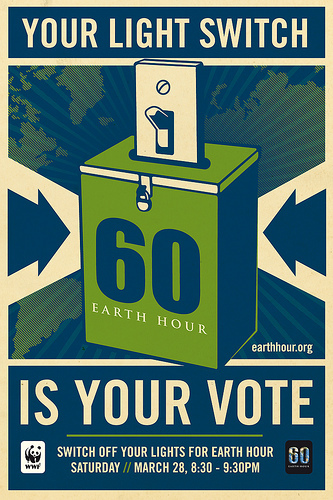 Just in case you have not heard, the WWF (World Wildlife Fund) is urging people of all ages, nationalities and background to turn off their lights for one hour on March 28th 2009 8:30PM (your local time), their goal for 2009 is for one billion people to participate. Maybe ill try to do some art during that time using a dynamo LED lamp I got for Christmas, we shall see. 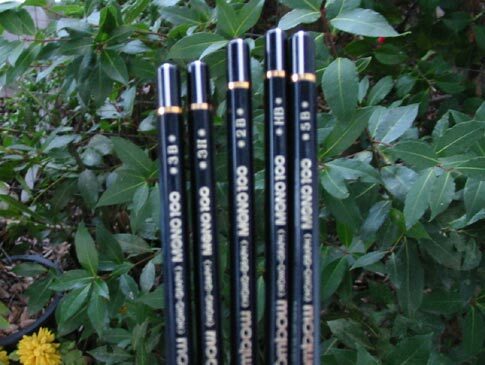 Seriously, I have been trying to locate the Tombow Mono 100 pencils locally and as you read in the previous post, while I did find them one had to purchase the whole set and only one grade. Well, I encountered someone online that lives in Japan that was able to purchase specific grades, so I got a few for my wife and I… they arrived yesterday. Hope everything is going well for you outhere. Remember SketchCrawl #22 is just around the corner so hope to see you at the forums and/or around San Francisco next month. This past weekend I had the opportunity to attend WonderCon 2009 and after that I took a quick trip to the Kinokuniya Store in San Francisco, CA. Saturday was practically a 12hr day for me, from getting up at 7am to getting back home at 7pm, and a lot of fun and discovery in between. I purchased a ticket in advance, so that saved me from standing in one of two lines inside of the Moscone Center. There was however a very long line outside that wrapped around the block on the way in. Good thing it wasn’t raining at that time. What was it like? 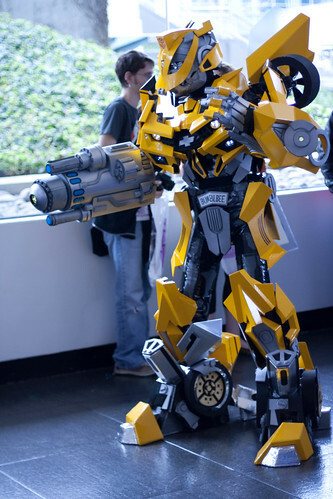 it was great, initially I didn’t see great costumes but as the day progressed I got to see some really cool stuff, like this transformer below. Another cool thing to watch was our good old friend R2D2 (a couple of droids actually) yeah they attract the attention of everybody old and young. 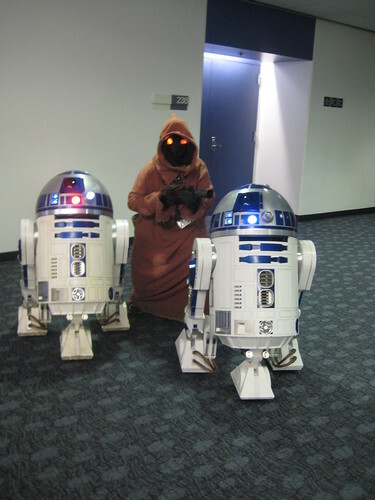 The following site contains more info about these droids, www.artoo-detoo.net – now there is another way to be creative. As you can see this was one busy day! 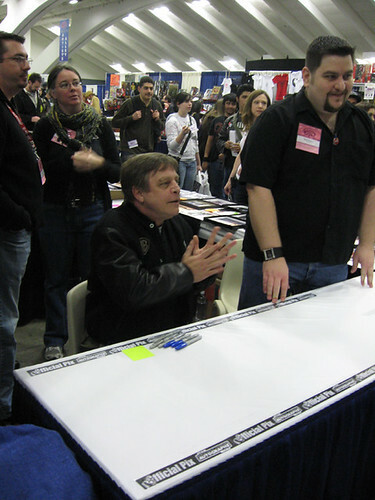 I also had a chance to attend a few panels / presentations and visit Enrico and his friends (in two separate booths). 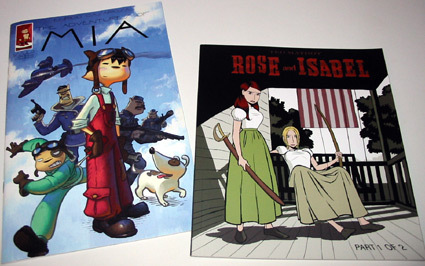 Below is a copy of Mia by Enrico and a copy of Rose and Isabel comic by Ted Mathot – read both comics non-stop in one sitting, and now I want to know what happens next. I have been following Ted’s blog for a while and just recently started to read some of his old posts. There is quite a lot of information there to learn from (thank you for taking the time to share). 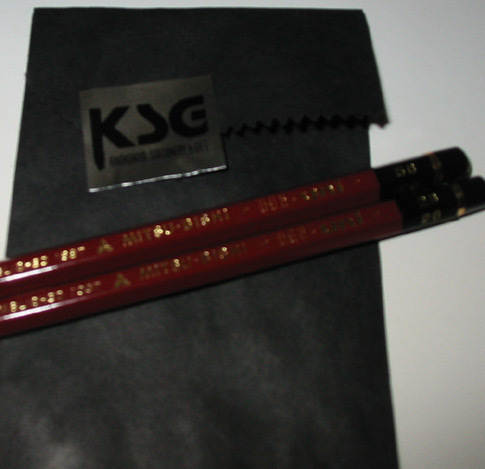 Lastly, I managed to take a quick trip to the Kinokuniya store in San Francisco, with the only mission of finding those pencils (I was also out of time, so it had to be a quick visit). I found both brands I was looking for but for the Tombow Mono 100, you have to purchase the whole box and they didn’t have the grade I wanted, so I just purchased (Mitsubishi Hi-uni) pencils, two for my wife and two for me… to try them out (2B and 5B). That was one busy Saturday!